Ken Bredemeier | VOA Jan 9, 2018. WASHINGTON — U.S. President Donald Trump told key lawmakers Tuesday that he would sign whatever legislation they agreed upon to protect hundreds of thousands of young immigrants from being deported and to improve security along the country’s border with Mexico. In an extraordinary televised meeting at the White House, Trump said that comprehensive immigration reforms could be dealt with later. He said he still believed a wall needed to be built along at least part of the 3,200-kilometer (1,990-mile) U.S.-Mexico border, but he seemed to back off earlier demands that it be funded immediately. “When this group comes back with an agreement, I’m signing it,” Trump said. The U.S. leader said lawmakers need first to protect as many 800,000 young immigrants — brought illegally to the United States years ago by their parents, mostly from Mexico and Central American countries — from being deported. Trump last year rescinded DACA, an administrative program implemented by former President Barack Obama that protected the youths from deportation, but he gave Congress until March 5 to come up with legislation that provided similar protections. Trump normally dismisses reporters and photojournalists from his meetings after perfunctory remarks, but on Tuesday he allowed them to watch the immigration discussions with lawmakers for 45 minutes. 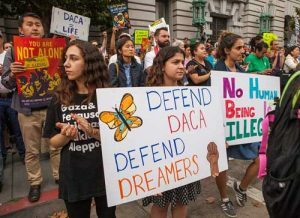 Some Republican lawmakers pushed back on Trump’s agreement to prioritize dealing with young immigrants — sometimes called Dreamers after the DREAM Act, earlier federal legislation that would have provided protections similar to those in DACA but was never approved. But as the discussion continued, Trump also said border “security” needed to be dealt with, even as he left it up to the lawmakers to work out details. Trump’s new homeland security chief, Kirstjen Nielsen, told him, “Border security has to be part of this or we’ll be back here three, four or five years from now,” still dealing with illegal immigration across the border with Mexico. U.S. officials say Trump’s hard line on immigration policies last year sharply cut the number of migrants entering the country illegally from Mexico. The contentious immigration issue took center stage as Trump and Congress face a January 19 deadline to agree on a federal spending plan that will run through September. They already have been forced three times to agree on temporary plans.But rather than wait another two months to vote on legislation protecting the immigrants in the country under DACA, Democratic lawmakers are pushing to resolve the issue as part of the budget talks. Trump, even as he rescinded the DACA program, has occasionally voiced sympathy for the plight of the young immigrants, many of whom know the U.S. as their only home. But in exchange, Trump wants passage of a number of other immigration-related measures, including the effort to increase border security by constructing a wall that he vowed during his 2016 presidential campaign would be built and paid for by Mexico. Now Trump has called for an initial $18 billion in U.S. taxpayer funding for the wall, a proposal that Democrats and some Republican lawmakers oppose. A compromise — with protection for the young immigrants and some enhanced border security, without construction of the wall — could eventually be reached. But lawmakers said that was not likely at Tuesday’s meeting as they considered options for resolving the standoff with Trump. The top Democrat in the House of Representatives, Minority Leader Nancy Pelosi of California, told reporters Monday, “I think we will” reach an agreement on the young immigrants, mainly because neither Democrats nor Republicans want the lack of a spending bill to force a partial government shutdown at the end of next week.